You are seeing it this here. If he left, it would be Rockets fans only discussing other players . This is his Rockets forum account that's spamming us. I'm sure he has one for every team in the NBA and setting alerts for "Lin". I'm posting about Lin in a Lin thread. How is that spam? Raptors traded Delon Wright, who was a part of their regular guard rotation, in the Marc Gasol trade. They can use another guard with or without Van Vleet. Lin to replace Wright, the point guard. Nope...this one just happens to be the most active one, so I'm here. Patrick Beverley played for 5 consecutive years for the Rockets...yes, there was a coaching change and some of the players around him changed, but for the most part he was in a stable environment for those years. And...Beverley had a skillset that was a better fit to play next to Harden...if you want to call that "outplayed", then that's fine...but Lin was clearly the better playmaker and overall PG between the two of them. 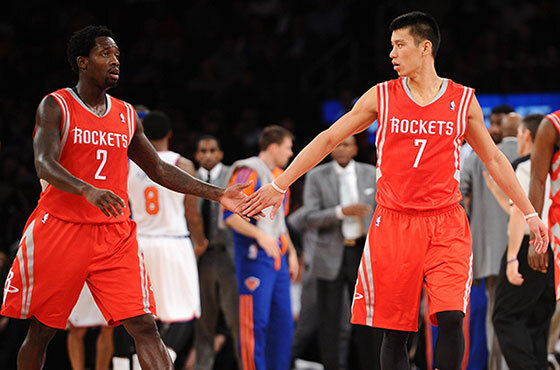 The main knock on Lin in Houston was as you said...he made dumb mistakes. But as a young player, he was hardly the only player to make mistakes. Beverley made plenty of mistakes too. But Beverley had stability in his first 5 years in the league...something Lin (and many other NBA players) did not have at all. Ok Hawks...how about buying out Bazemore now? Ok, if that makes sense to you then I can’t argue with you. But McHale said it was because the fit was better with Bevs 3&D next to Harden and Lin’s playmaking with the second unit. I hate it when LOFs try to tell ROCKETS FANS lies. While critics hammer the Rockets for benching Jeremy Lin, the numbers paint an entirely different picture: Patrick Beverley is the best fit as the starter. The five most-watched videos ever on ClutchFans are as follows: Three Jeremy Lin highlights, a Jeremy Lin interview and a clip of Patrick Beverley being thrown to the floor. So trust me when I say I know what many fans want to hear. I know how easy it would be right now to be that pageview-pushing troll who writes that Kevin McHale has an irrational dislike of Jeremy Linand is killing a championship team because of it. Unfortunately I can’t do that, because it’s just not true. Jeremy Lin should not start for the Houston Rockets. That job belongs to Patrick Beverley right now, and frankly, it’s not even a close call anymore. When Beverley went down with a fractured hand in December, expected to be out four to six weeks, it gave Jeremy Lin the perfect opportunity to show he was the right fit in the starting lineup. After all, the criticism coming from some of Lin’s fans was that there was no way of knowing how Lin would do in the same position, if given the same starting opportunity. First, we have to understand what makes up the starting lineup. James Harden, Dwight Howard and Chandler Parsons are absolute locks. The Rockets are thin at power forward options, but Terrence Jones has emerged and is developing rapidly. He has been the starter for over two months and, barring trade, that’s not going to change anytime soon. So that’s the gig in Houston: The point guard that maximizes and complements this starting core is the one that should start. Take a look at how those four have done with Beverley compared to with Lin. The results so far show that the Rockets were right all along to start Patrick out of the gate this season. Keep in mind, this is only the data with those players, so last night’s incredible +26 performance from Beverley — a game where it was blatantly obvious the kind of impact he has on this team — doesn’t even factor in since Terrence Jones didn’t play. What this shows us is that per 100 possessions, Houston’s starting core with Beverley outproduces opponents by nearly nine points more than the same four players with Jeremy Lin. In fact, the Beverley lineup has the third-highest Net Rating in the NBA among lineups that have logged 200 or more minutes, trailing only the starting lineups for the Warriors and Pacers. Not only are the Rockets better defensively with Beverley, they have outproduced the Lin-led lineup on offense as well. Why? Because the Rockets move the ball better, rebound better, shoot better and turn the ball over less. Furthermore, Jeremy Lin’s individual play off the bench behind Harden and Beverley has been much more efficient compared to when he starts at point guard alongside Harden. In 17 games as a starter next to Houston’s star two guard, Lin is shooting 43.5% and just 28.6% from three for 12.9 points a night in 32.9 minutes. Coming off the bench? Lin is hitting 48.9% from the field and 34.4% from three for 12.6 points per game in 27.1 minutes. That’s essentially the same point total in nearly six minutes less a night. “One of the challenges with our starting lineup is, with James and Dwight and others in that lineup, it’s hard for (Jeremy) to be in full attack mode and that’s when we think he’s at his best,” said Rockets GM Daryl Morey on SportsTalk 790 last week. In other words, Beverley is the better fit as the starter. Lin is the better fit as the Sixth Man. Why do the critics insist the Rockets start an inferior five-man lineup? That’s a good question. Granted, this article won’t stop some of Lin’s fanatics from continuing to claim that the Rockets have it in for one Jeremy Lin. Just understand they’re wrong. Dead wrong. Because McHale starting Beverley over Lin isn’t bias or hate. That's McHale basically saying "we've had enough of Lin's boneheaded turnovers & Bev's the starter"